Orlando Pirates have set a new unbeaten record against their arch-rivals Kaizer Chiefs. Pirates are still unbeaten against Chiefs in twelve matches stretching back to December 2014. The two sides drew 1-all in the 166th derby between the two Soweto giants. Meanwhile, log leaders Bidvest Wits went 2-1 down to Highlands Park in Tembisa on Saturday afternoon. The sold-out game had to be delayed for about ten minutes due to the late arrivals of fans. Both sides made several changes to the teams that started during the last meeting between the two sides last November. Several players featured in their first derby for Amakhosi with Daniel Akpeyi getting the nod in goals, and youngster Happy Mashiane was also included in the starting line-up. On the side of Bucs, defender Alfred Ndengane tasted his first derby action alongside captain Happy Jele in the heart of defence. Chiefs, who started the game lying sixth on the log, controlled the opening minutes of the proceedings. Parker but minutes later Sandilands made another important save. punish Chiefs from inside the box. went to sleep and the first half failed to produce any goals. Referee Abongile Tom pointed to the spot when defender Asavela Mbekile was adjudged to have fouled Billiat inside the box. Chiefs defender Daniel Cardoso stepped up to put his side in the lead. The home-side did not take their foot off the pedal in search of another goal but they were denied by Sandilands minutes later. equaliser for Pirates with ten minutes remaining. 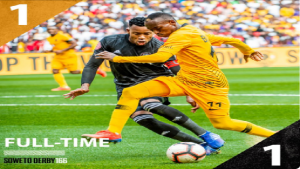 The post Pirates continue their unbeaten streak against Chiefs appeared first on SABC News – Breaking news, special reports, world, business, sport coverage of all South African current events. Africa's news leader..